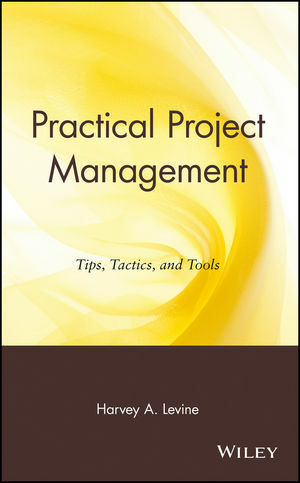 The author has 39 years of experience implementing project management techniques. Includes unique material based on the author's experiences that cannot be found elsewhere. Readers can refer to self-contained chapters for quick reference and problem-solving or read the entire book. HARVEY A. LEVINE has been a project management professional for thirty-nine years, providing applications, system design, and consulting services in project planning and control, mostly with General Electric. In 1986, Levine founded the Project Knowledge Group, a consulting firm specializing in project management training; project management software selection, evaluation, and implementation; and project management using computers. He has also served on the board of directors of the Project Management Institute and was recently elected a Fellow of PMI. 1. Setting Up the Project Management Operation. 1.1 About Projects and Project Management. 1.2 Organizing for Project Management. 1.3 Does Your Company Need a CPO? 1.4 Implementing a Computer-based Project Management Capability. 2.2 Do You Weebis? Clarifying WBS, OBS, and RBS. 3.2 Critical Path, Critical Chain, and Uncertainty: Exploring Concepts of Shared Contingency. 3.4 How Important Are Schedules and Time Compression? 4. Resource and Workforce Management. 4.1 An Overview of the Different Elements of Resource Management. 4.2 Role-based Needs for Managing Resources in a Project-driven Organization. 4.3 Resource Leveling and Games of Chance. 5. Budgeting and Cost Control. 5.1 Concepts and Issues of Project Budgeting and Cost Control. 5.2 Software Support for Cost Management. 6. Risk Management and Contingency. 6.1 Using and Managing Contingency. 6.2 Risk Management for the Sigmaphobic: Managing Schedule, Cost, and Technical Risk and Contingency. 6.3 Some Computer-based Approaches to Schedule Risk Analysis. 7.1 Change Control and Scope Management. 7.2 Real-time Status versus Period Data. 7.3 Automatic Project Management: A Classic Oxymoron. 8.1 Measuring the Value of Work Accomplishment. 9.1 Defining and Implementing Project Portfolio Management. 9.2 Bridging the Gap between Operations Management and Projects Management: The Important Role of Project Portfolio Management. 9.3 Project Selection and Risk: Risk Management Is an Essential Part of Project Portfolio Management. 10. Project Management, Enterprise Project Management, and Enterprise Resource Planning. 10.1 The Search for Automated, Integrated, Enterprise-wide Project Management: Minnesota Smith and the Temple of Unrealized Dreams. 10.2 Integrating PM and ERP. 11. Project Management and Professional Services Automation. 11.1 Defining the PSA Market. 12. Tools of the Trade. 12.1 A Simplified and Balanced Approach to PM Software Selection. 12.2 New Names for Old Games: Rebadging Sound and Proven PM Concepts. 12.3 The e Revolution: Collaboration Services, B2B, Gateways. 13. Making Project Management Work. 13.1 Implementing Project Management: Commitment and Training Ensure Success. 13.2 Making Project Communication Work: Everything You Need to Know about Project Communication. 13.3 Why Project Management Implementation Programs Fail. 13.4 Teams, Task Forces, and Bureaucrats. 13.5 The Psychological Contract: How to Stimulate Initiative and Innovation in Any Organization.